I love slice ‘n bake cookies! None of the messy business of rolling out and cutting the dough. Simply slice into rounds and bake! 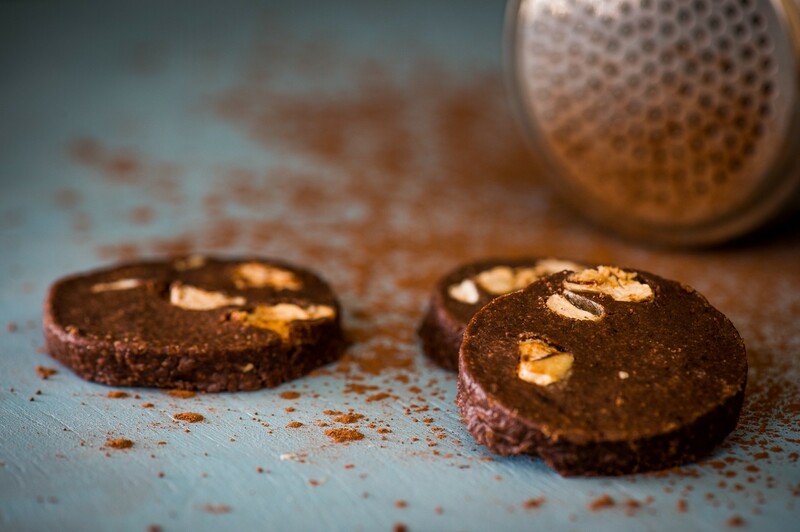 These Chocolate Nougat Cookies have a rich, chocolate flavour and buttery texture like shortbread. The bits of nutty nougat add a crunchy pop of sweetness to every bite. The recipe makes two logs of dough. I like to bake one and freeze the other – handy when that cookie craving hits! Cream together the butter and castor sugar for 4-5 minutes, until light and fluffy. Add in the vanilla essence and beat well. Sift together the flour, cocoa and salt. Add to the creamed mixture in thirds, mixing until combined. Do not overwork the mixture at this stage. Lastly, stir in the nougat pieces. Bring the dough together with your hands (it may be a little crumbly). Divide the dough in half, and roll each half into a sausage shape, 4-5 cm in diameter. Wrap in clingfilm and refrigerate for at least 1 hour. Preheat your oven to 170°C.Working with one sausage of dough at a time, use a sharp knife to slice the chilled dough into rounds, about 1cm thick. Place rounds on a lightly greased baking tray and bake for 10-12 minutes, watching that the nougat doesn’t start to brown. Allow the cookies to cool on the baking tray for 15-20 minutes after baking then remove and allow to cool completely on a cooling rack.